This recipe comes from Food Gift Love, ©2015 by Maggie Battista. (Reproduced by permission of Houghton Mifflin Harcourt. All rights reserved.) The founder of the award-winning artisan food marketplace Eat Boutique offers up more than 100 recipes for food gifts to share, along with wrapping suggestions for maximum impact. My Pear-Pineapple-Ginger Jam is one of my favorites; it is deep, sweet, and packed with a heavy dose of ginger spice. It perks up anything it touches, like a pile of fluffy pancakes, pound cake, or a runny cheese, and it has the perfect consistency for whisking into cocktails. For a sweet-and-savory thing, slide a bit into a chicken sandwich, glaze a duck breast, or slip it into a first-rate grilled cheese sandwich. While this process requires a bit of technique, it’s a wonderful way to spend an afternoon. Once made, you’ll have mastered one of the quirkier jam processes—the sort that requires puréeing the fruit during the cooking phase. Two big lessons to take away here: First, the most direct way to success with any fruit preserve is to weigh the fruit and the sugar with a kitchen scale. The right proportions will ensure that your gift is safe to sit in a pantry. I prefer a 2 parts fruit to just over 1 part sugar ratio, and that’s generally perceived as the minimum sugar required for long-term preservation. Second, puréeing hot fruit, whether with an immersion blender or food mill, lets you achieve a texture to match the tastes of your family and friends. For gifting, write the label on a tag. Wrap a length of rope around the jar, and slip the tag through the rope. Tie a knot, and trim any excess rope. Weigh your prepared fruit. The prepared pear and pineapple, in total, should weigh about 4 pounds. If you’re preserving/canning your jam for long-term storage, sterilize your canning jars and prepare your water bath-canning pot. Place a small plate with 4 to 5 small spoons in a flat space in your freezer. Now let’s make jam: Wrap your ginger knob in a bit of cheesecloth; this will make it easier to avoid when puréeing and easier to extract from the pot later. Add the fruit, sugar, lemon juice, gingers, and vanilla to a nonreactive pot that’s both wide and deep (a 10-inch or 12-inch diameter is ideal), and stir to combine. Place over medium-high heat. Bring to a boil and then reduce the heat slightly. During the first 45 minutes of cooking, your jam will have large bubbles and create lots of foam—do not stir the jam during this stage; let it continue to cook past the foaming stage. After the foaming has subsided, stir your jam a few times to keep things moving. After 45 minutes of total cooking, remove from the heat and carefully puree about half the jam, avoiding the ginger knob, with an immersion blender. If you don’t have an immersion blender, carefully purée 1 to 2 cups in the bowl of a food processor. (A food mill works well, too.) Everything will be very hot, so please be very careful. Add this puréed fruit back to the pot. Place the pot again over medium-high heat, and watch your jam closely as it will be ready within the next 15 to 20 minutes or so. Stir it every few minutes to keep things moving and prevent burning. Once all the moisture has evaporated and you’re left with a very thick, hot syrup, begin checking for doneness. Here are the signs that your jam is ready: the mixture looks glossy and shiny; the mixture begins to thickly coat the back of your spoon and the bottom of the pan, and the mixture has darkened slightly in color. If all signs point to done, conduct a spoon test. Remove from the heat to slow down the cooking each time you test the jam. Place 1 teaspoon of the mixture on 1 of your frozen spoons and quickly return to the plate in the freezer. After 2 minutes, check to see if the jam has thickened on the frozen spoon by rocking it from side to side. If it’s very loose and runny, return to medium heat and keep boiling and stirring the mixture. 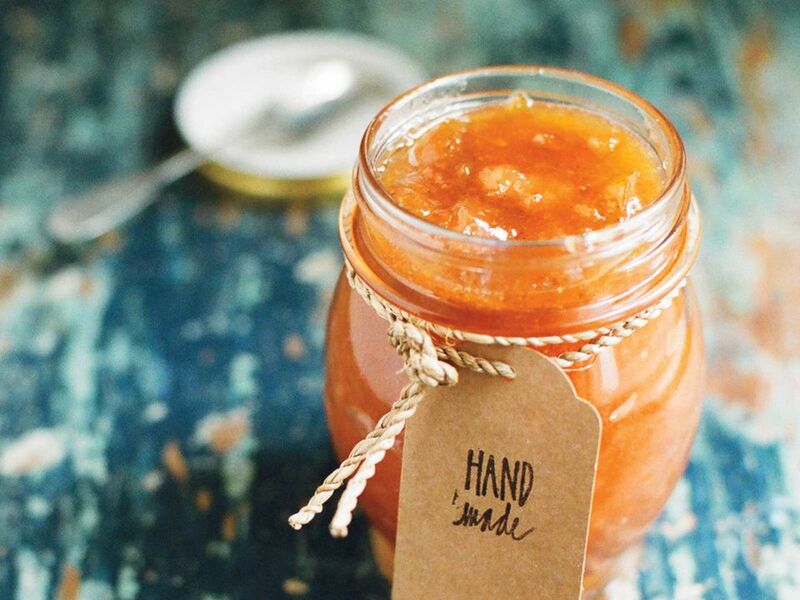 When your jam barely moves on the spoon, it’s ready. When it’s ready, remove from the heat and do not stir it any further. Carefully remove the ginger from the jam and discard. If you’re not preserving/canning the jam, allow the mixture to cool and then store in the fridge up to 4 weeks in a sealed container. If you are preserving the jam, ladle your jam through a funnel into your prepared jars, leaving ¼ inch of headspace. Tap the jar a few times to loosen any air bubbles. Wipe the rims and seal carefully, as the jars will be hot. Place the jars in a single layer in your pot of boiling water. Once the water bath boils again, process these jars 20 full minutes. Store up to 1 year in a dark pantry. What Is an Easy Recipe for Homemade Mulberry Jam?